Ketchum's Five Star Kitchen Design women made it three in a row Sunday by winning the three-day McCall Ospreys Chix with Stix hockey tournament at Manchester Ice Centre, McCall. The Five Star gals won their third consecutive Chix tourney with a 4-0 record and 21-10 scoring advantage. Leading the way with Sara Schroeder (9 goals), Annie O'Sullivan (6 goals) and Dotty Hand-Sarchett (5 goals). Ketchum won their games 6-2 over Palouse Pond Hockey All-Stars, 6-5 over Boise Wildfire, 3-1 over Provo (Utah) Blades and 6-2 in the championship over Boise Wildfire. Game Most Valuable Players were Schroeder, Hand-Sarchett and O'Sullivan. Coach Nicole Perkins elected to award the entire team the MVP award for the 6-2 title game triumph. Against Palouse, the Five Star skaters erased an early 1-0 deficit with four unanswered goals. Schroeder and O'Sullivan each scored twice. Facing only seven shots was ex-Five Star goalie Joanie Whitcomb, now living in Hawaii. Five Star trailed Boise Wildfire 4-1 in the second period of its second game but rallied for the 6-5 win behind Schroeder's three-goal hat trick and two more goals by Hand-Sarchett. Former Wood River skater Ashley Hesteness played an outstanding game for Boise. The Ketchum squad out-shot Provo Blades 26-5 and prevailed 3-1 behind two more goals by Schroeder. In Sunday's championship, Ketchum built a 3-2 lead after one and shut down Wildfire the rest of the game, while scoring three more. O'Sullivan tallied a hat trick. 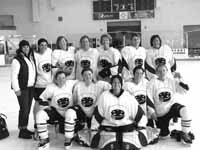 Stabilizing Five Star squad in front of goalie Whitcomb were the defensive pairings of Jen Embree-Lacie Hernandez and Nancy Parsons-Brown and Tess O'Sullivan-Fryberger. Weekend scoring: Sara Schroeder 9 goals/4 assists; Annie O'Sullivan 6/5; Dotty Hand-Sarchett 5/5; Bege Reynolds 1/0; Tess O'Sullivan-Fryberger 1/0; Jini Griffith 0/1; and Erin Griffith 0/1.